Employers are having a hard time hiring. Not enough workers or not the right skills? How are recent moves affecting businesses in the Fifth District? 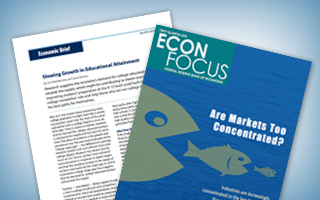 Cover Story: Are Markets Too Concentrated? Industries are increasingly concentrated in the hands of fewer firms. But is that a bad thing? Americans pay a lot for prescription drugs. Does that mean we pay too much? Can "sin taxes" be good for your health and the economy? Does it matter whether people who lost their homes during the foreclosure crisis come back to the housing market? This issue looks at the economic situations that Americans face at various points in their lives — and the implications for economic policy and personal finance. Online nonbank lenders have experienced tremendous growth. What promises, and perils, do they hold for the financial system?